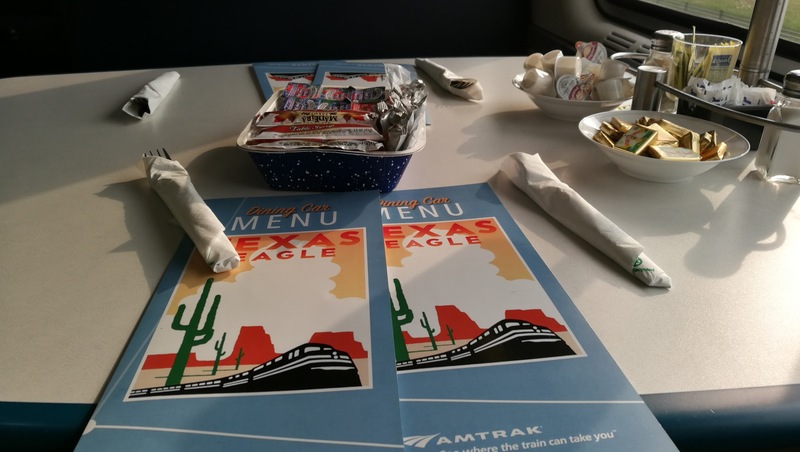 When some family members moved to Dallas, it seemed like a great time to try Amtrak’s Texas Eagle route. I’m lucky that Vanessa likes riding Amtrak long distance just as much as I do and she’ll always jump at the chance. The Texas Eagle was new to both of us. 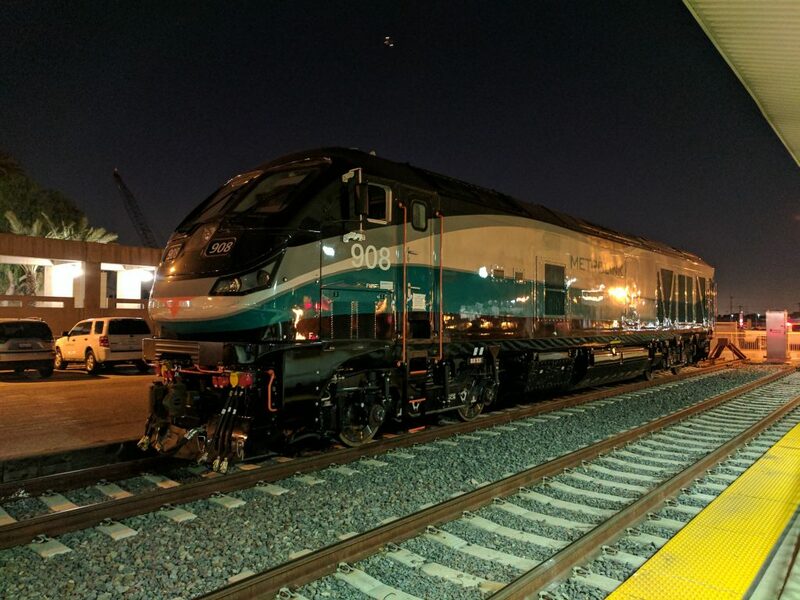 It’s a train that runs from Los Angeles to Chicago via San Antonio. What makes this train particularly interesting to me is that only two cars actually make the whole journey, one sleeping car and one coach. 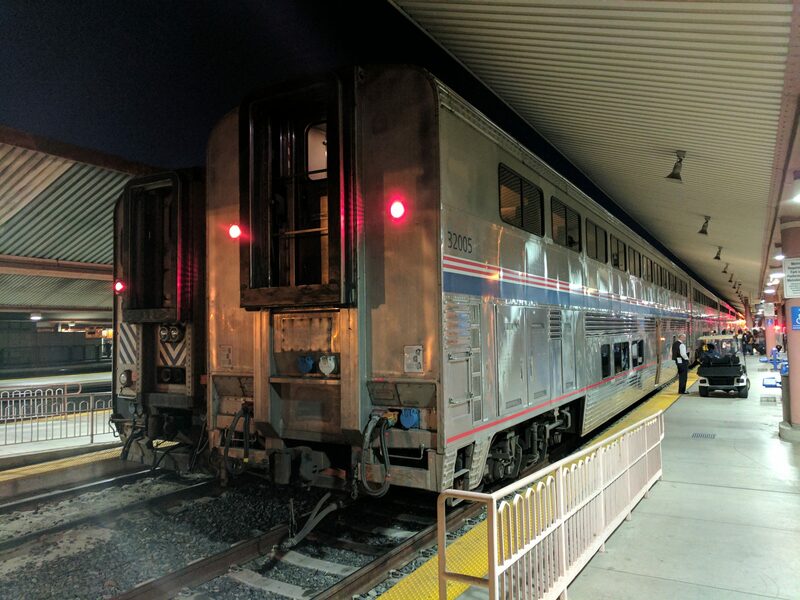 These two cars are attached to the end of the Sunset Limited from Los Angeles to San Antonio, where they are uncoupled and added to additional Texas Eagle cars that run from San Antonio to Chicago. Part of the reason Amtrak does this is because they currently only run between Los Angeles and San Antonio three days each week, but between San Antonio and Chicago daily. Flying down from San Francisco was easy. We took the Flyaway bus to LA Union Station. If you haven’t been before, it’s absolutely worth a visit. 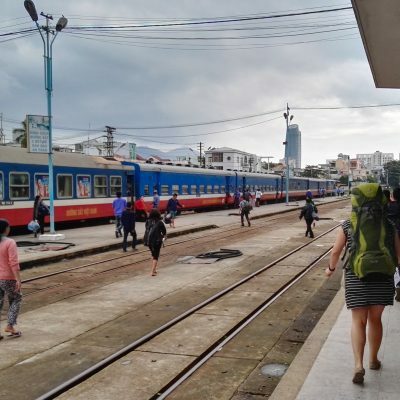 Stunning Art Deco architecture, bustling corridors, and beautifully landscaped courtyards – it’s known as “the last of the great train stations” and it’s easy to see why. 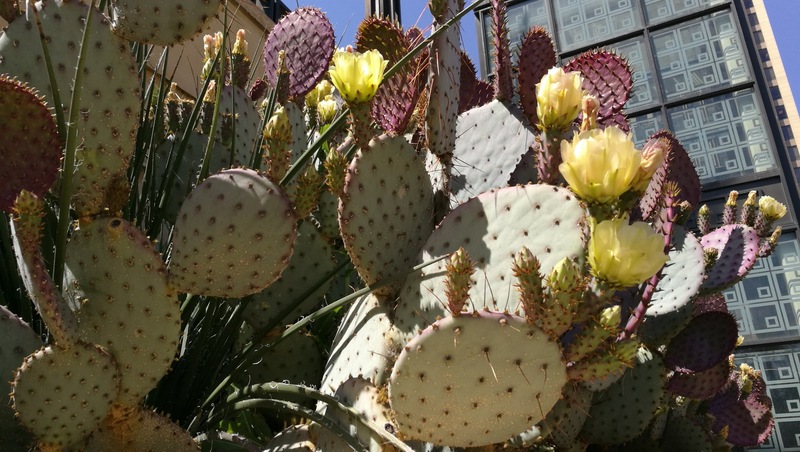 Cactus in bloom on the east side of LA Union Station. In front of LAUS before departure. 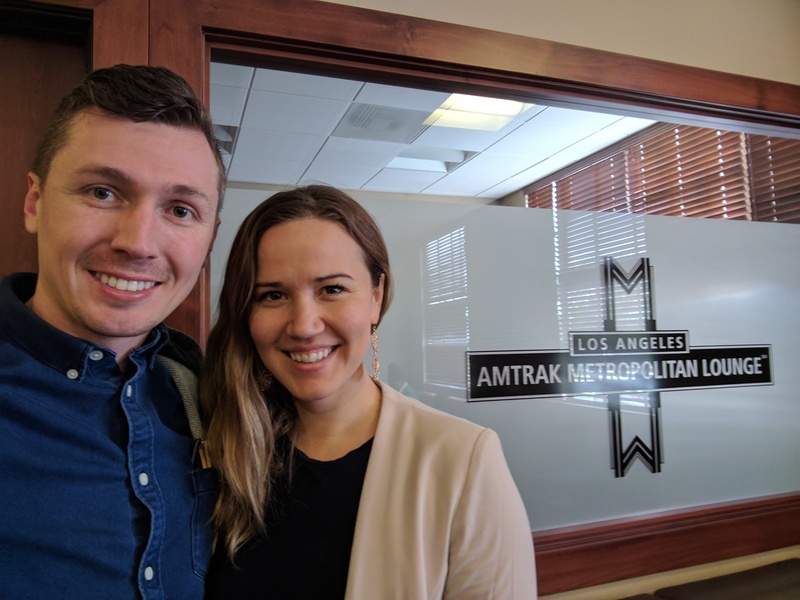 Since we were traveling in a sleeper, we headed to Amtrak’s Metropolitan Lounge. Unfortunately you have to ride in a glorified freight elevator to make it up into the lounge, but it offers a quiet place to rest or leave your bags while you explore downtown LA. Bathrooms are typically clean in the lounge. Food and drink options are self-serve and basic, but complementary. When it’s time to board Amtrak has a “red cap” assistant on a golf cart drive you straight from the lounge to the train. I still typically walk, but it’s nice to have the option. Dropping our bags off at the Metropolitan Lounge earlier in the day. Although our train wasn’t leaving until 10pm, Amtrak decided to board it at 8:30pm. They said this would allow us to settle in and get to sleep. It was nice to have the option, although neither one of us went to sleep before midnight. I took a few pictures on the platform while waiting for our departure time. Amtrak P40 817 and P42 56 lead our train LA-San Antonio. 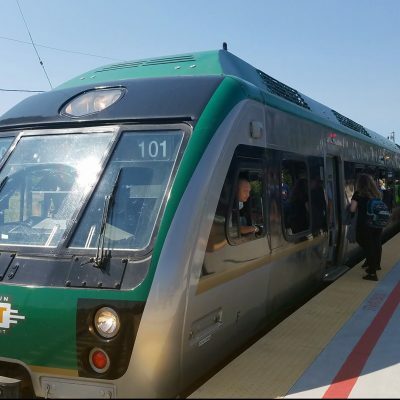 New Metrolink F125 #908 on the next track over. 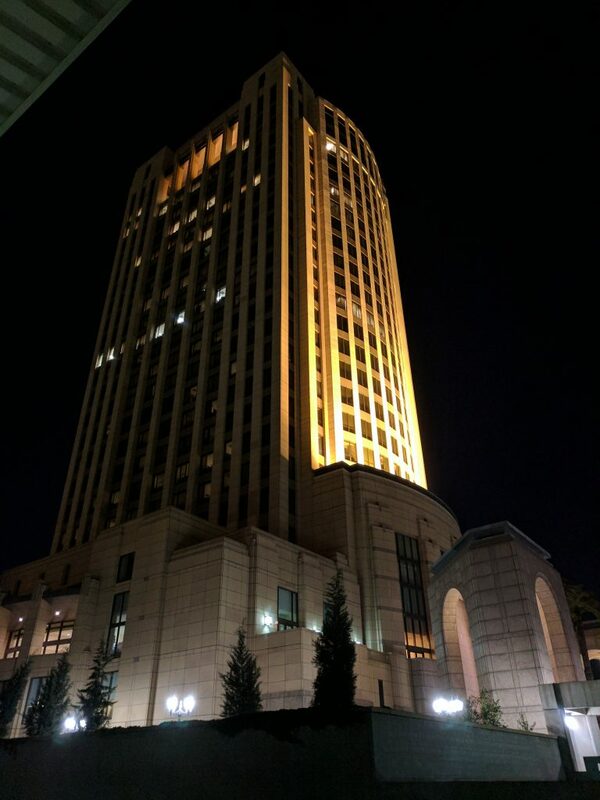 The MTA building at LA Union Station. The Texas Eagle train #422 is typically the last two cars on the Sunset Limited train #2. As we settled into our room, our sleeping car attendant to San Antonio, Stephen, came through and asked us what time we’d like our room turned down. The roomette on Amtrak is a bit small (we love it for two of us) and once it’s turned down, it’s a bit difficult for two people to be on the bottom bunk. Normally car attendants don’t like to turn down rooms later than 10pm or so, but Stephan was nice enough to offer us 10:45pm, a time we gladly accepted to give us more seated time. 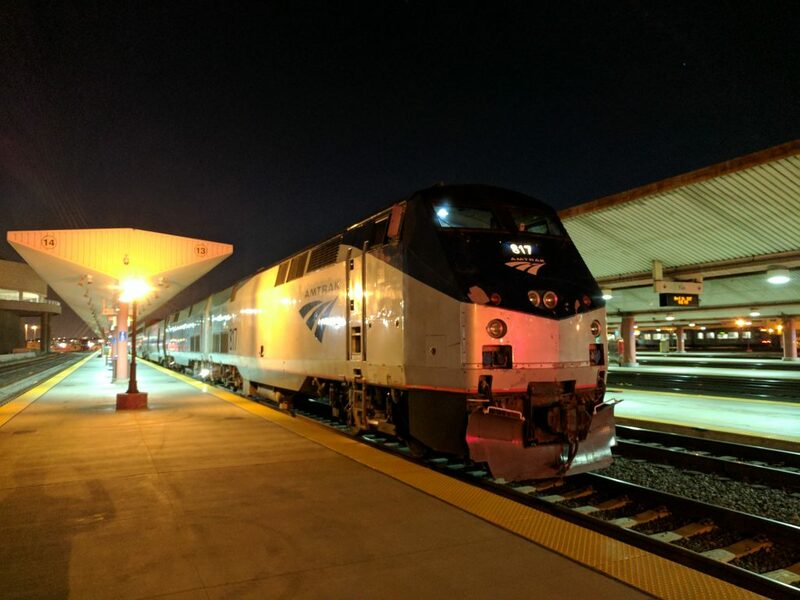 We were a bit late leaving LA due to a test train of Metrolink F125s ahead of us, but with Amtrak long distance trains it’s best to just go with the flow. They easily lose or make up time along the route. There isn’t much to see heading out into the inland empire, so not long after Stephan turned the beds down I hopped into the very small top bunk and we tried to get some sleep. On Amtrak I find I sleep much better if I bring a mask and ear plugs. You don’t have much control over the temperature of the room, so have a couple of different options for sleepwear. If you talk to your sleeping car attendant if anything is wrong, my experience is they do their best to make things right. Stephen on this trip was amazing. The bathrooms were never dirty and he never scoffed at special requests. He asked us if the temperature was comfortable. All-in-all he’s among the best that Amtrak has to offer. The next morning we woke up between Maricopa, AZ and Tucson, AZ. We barely got dressed in time to hop off the train in Tucson for a quick picture. Can you tell we need some coffee? While I like that the Texas Eagle sleeper is on the back of the train (quieter), you do have to walk through a few coach cars to get to the dining car. The coaches on this trip were PACKED full and it can take a bit of time to work your way up for meal service. A big perk on Amtrak is that when you book a sleeping car room, all meals in the dining car are included. 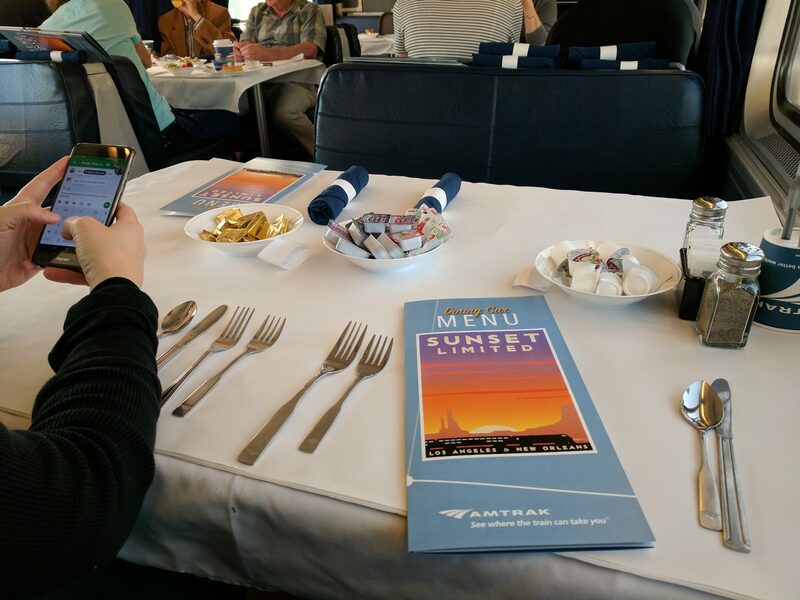 Amtrak had just refreshed the dining menu prior to our trip – so recent that the dining car staff made mention that this was the first time they had served it. Overall it is a lot of the similar options as before, with a few new things mixed in. Although we were riding in a Texas Eagle car, the dining car was considered part of the Sunset Limited. Confused yet? My breakfast french toast was pretty good. The communal seating in the dining car helped us meat a couple of nice people, one headed all the way to Florida to see he grandchildren, the other to Oklahoma City to visit family. It’s always interesting to see who you’ll get seated with. About an hour out of Tucson. This day had us cross three different time zones. We started in Pacific, hit Mountain time by lunch, and Central time at dinner. This is the first time this has ever happened to me on Amtrak and I think it was due to the generally straight track and higher speeds through this portion of the country. It made scheduling meals a little complicated for the diner. The desert views were beautiful. This part of the United States is so sparsely populated that it was hours between stops. Lunch was served around El Paso, Texas where we could easily see into Juarez, Mexico. 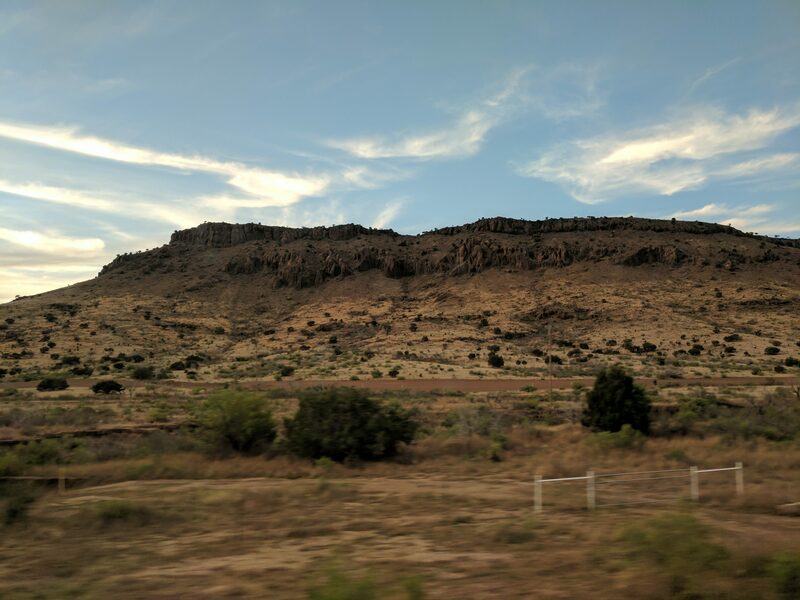 After El Paso you travel a long ways before reaching Alpine, Texas. It must be one of the longest distances between two stops in the Amtrak system. You also head south much further than I-10 meaning very little cell service. A couple of weeks before this trip we had been riding the Coast Starlight and enjoyed some Chandon sparkling wine. Vanessa thought it’d be nice to have some this afternoon across the desert, so we headed to the cafe car only to find that it’s not a system-wide offering. The cafe attendant informed us the Coast Starlight is a flagship train, and the Sunset Limited/Texas Eagle are not stocked with as many premium options. Oh well. 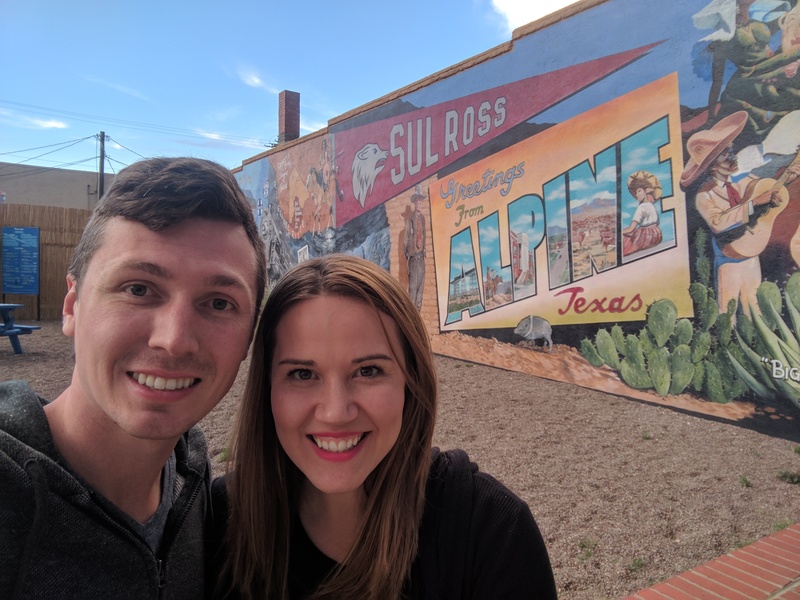 We pulled into Alpine, Texas 45 minutes early allowing us to walk the downtown a bit. The sunset was absolutely beautiful before we left Alpine. I’d like to come back here and check out the nearby town of Marfa along with Big Bend National Park. A high school was celebrating prom near the train station. All of the boys wore cowboy hats and boots – we’re definitely in Texas now! The sunset before departing Alpine. This night Stephen was nice enough to bring us dinner in our room. It was a nice break from the diner and is one of my favorite perks on Amtrak, but be sure to tip accordingly. It made a lot more work for him although he never implied it. I did not anticipate just how dark it would get at night for this portion of the trip. It was the darkest night I’ve ever seen while on Amtrak. There could have been a sheet over the window and I wouldn’t have been able to tell the difference. Stephen made a long announcement explaining how we’d be switching to the Texas Eagle during the night around 4am and would be the second car from the front of the train instead of all the way at the back. During the switching process he asked people to refrain from walking around or using the restroom. After his announcement he came around and turned down the rooms. Since it was so dark, we tried to get some sleep. I went ahead and got into the top bunk, leaving the “premium” lower bunk to Vanessa. I finally got to sleep not long after Del Rio, Texas. The switching in San Antonio did wake me up. Power to the car went on and off a few times, one of which caused the top bunk to get a bit warm since the air conditioning would stop. A couple of the couplings were a bit rough too. All in all it wasn’t the best sleep I got on Amtrak, but it wasn’t enough to keep me up all night. We woke up the next morning just before Austin, Texas. As promised, we had a new car attendant, Reggie, and were now at the front of the train. It was a bit much to process before coffee. Reggie told us he would make up our room while we were at breakfast. 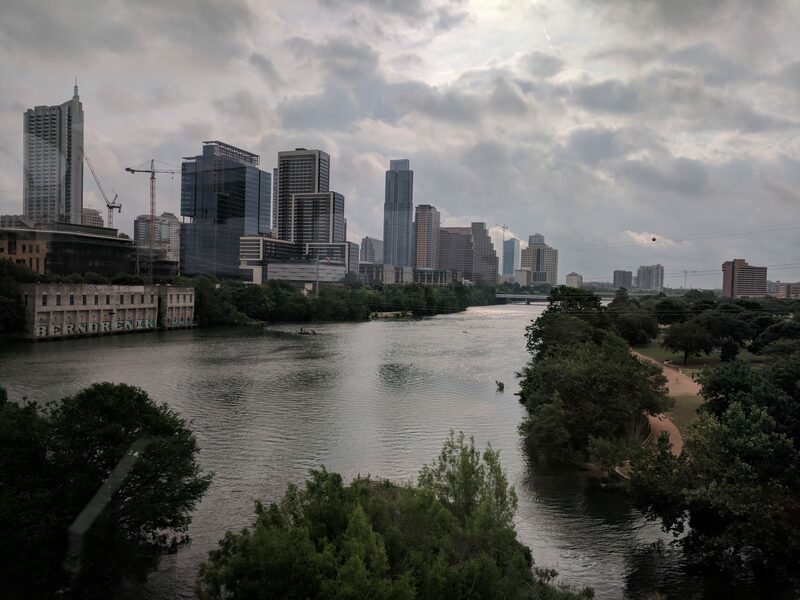 Crossing the river in Austin. 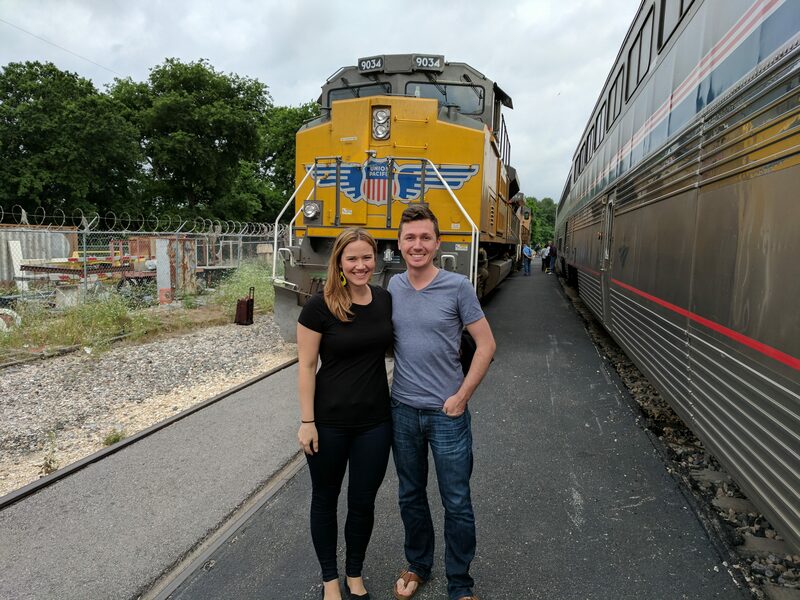 As we were walking around the platform during the service stop in Austin, one of the dining car attendants came out and offered to take our picture. I thought it was a nice thing to do! Shortly after departing Austin we made our way to breakfast. We had the pleasure to have breakfast with a nice young couple from New Zealand who were touring the entire United States over five weeks. What a cool thing to do! Now we’re really on the Texas Eagle! After breakfast we went to the observation car to give Reggie a bit of time to turn our room down. This day the scenery was completely different than the day before. Central Texas was extremely green with rolling hills, nothing like the arid desert of Arizona/New Mexico/West Texas. After a bit of time in the lounge we were feeling a bit antisocial and decided to head back to the room. 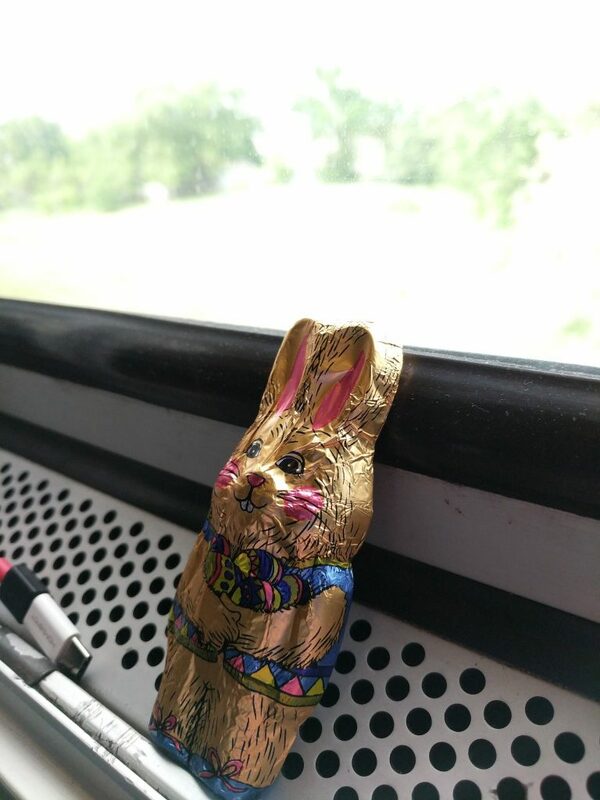 It happened to be Easter and, even though we were on Amtrak, the Easter bunny managed to find us! The last day flew by. It’s interesting how you get into a groove when you’re on a long train trip. The perception of time is different. We had lunch with a nice Irish young man also headed to Dallas and a woman making her way home to Wisconsin. The conversation was interesting, but unfortunately we had to cut it short as we approached Fort Worth in order to pack up and take a shower before arriving in Dallas. There was construction on the northern-ish TRE route Amtrak normally takes from Fort Worth to Dallas, so we were backed out of the station to take the busy freight route via Arlington. This was how the train was routed up until the last year or so, but it isn’t as common now. Even with the slight detour, we got into Dallas Union Station a bit early and met our family. I like the Texas Eagle. 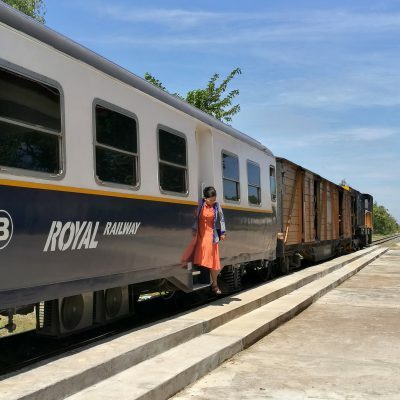 It may not have some of the “premium” amenities or as notable of scenery as other long distance trains in the system, but it has enough to entertain. The day across the desert is especially nice. Staff were consistently pleasant and hard working. We were always well fed and all of the food was edible, though not particularly notable. An interesting variety of people take the route making the communal mealtimes enjoyable. I’d still love to do the Chicago-Dallas portion in the future to compare. Perhaps for our next trip! Lovely report and photos. The sunset in Alpine, TX photo is stunning! Thanks for the feedback, Ben. That sunset was really memorable. It’s one of my favorite things about taking Amtrak long distance – you have time to slow down and watch the sunset! 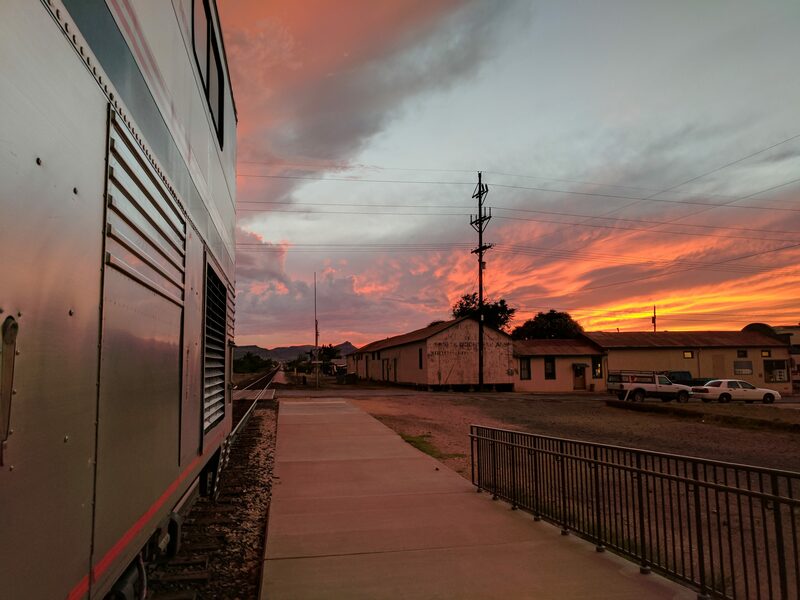 The Sunset was my first LD Train and I was born in Alpine,Texas where my grandfather was an SP Agent. Thank you Jim. How cool to have such a strong connection to Alpine! It was easily one of our favorite stops along the route. The Eagle is a good home train to have. Such a great trip report! I have never done a long distance Amtrak trip so excuse my question, but are you able to sort of “hop on and hop off” with this route? So instead of doing it in one multi-day trip, I could maybe stretch it out over say 2 weeks and therefore hop off in Texas for example, and then hop back on a couple of days later? Hi Kelli – Thanks for the comment! I highly suggest taking a long distance Amtrak trip at least once. It’s so much fun. As for doing stops along the way, it’s definitely possible. In fact I’ve done that before on other trips where I’ll get off for a couple of days and then continue the journey. 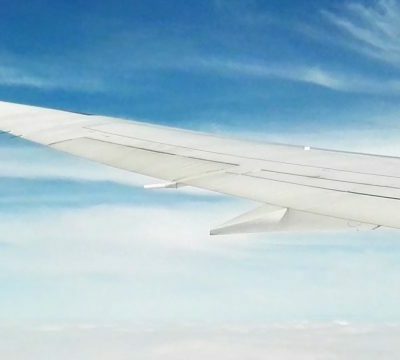 All you need to do is book separate tickets for each part of your journey. 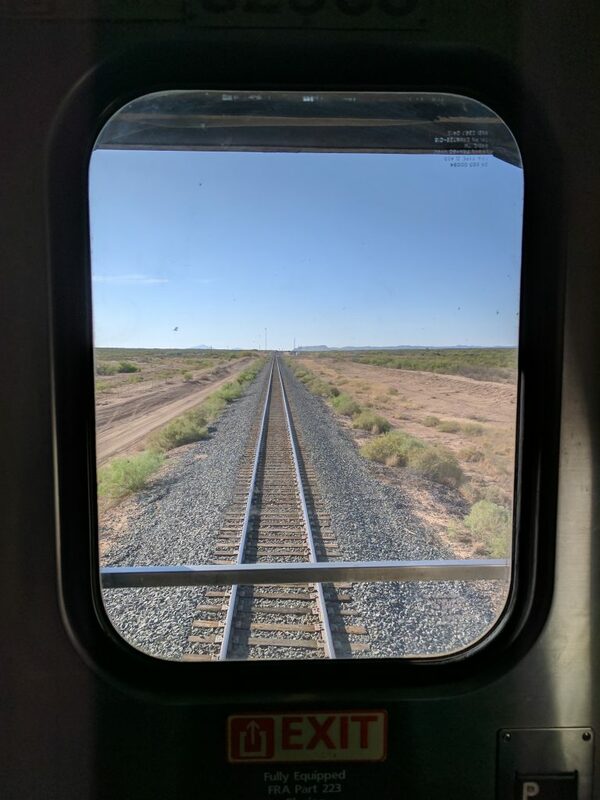 The only problem with the train that runs between Los Angeles-San Antonio-New Orleans is that it only runs 3 times a week. The portion between San Antonio-Chicago runs daily. That might not be a problem for you if you plan your trip around it. Have fun! I have been riding Amtrak cross country for 35yrs, always in a roomette or bedroom. Been on all except east coast trains. Will be going Maricopa to Milwaukee in 3 weeks. Of all the reviews I have read, and I have read many, this with the pics is the best. It gives people who may have never been on Amtrak a great idea of what to expect. Thank you so much for your kind words, Don! Cheers to your next Amtrak adventure. How wonderful to read your story together with your great photographs. 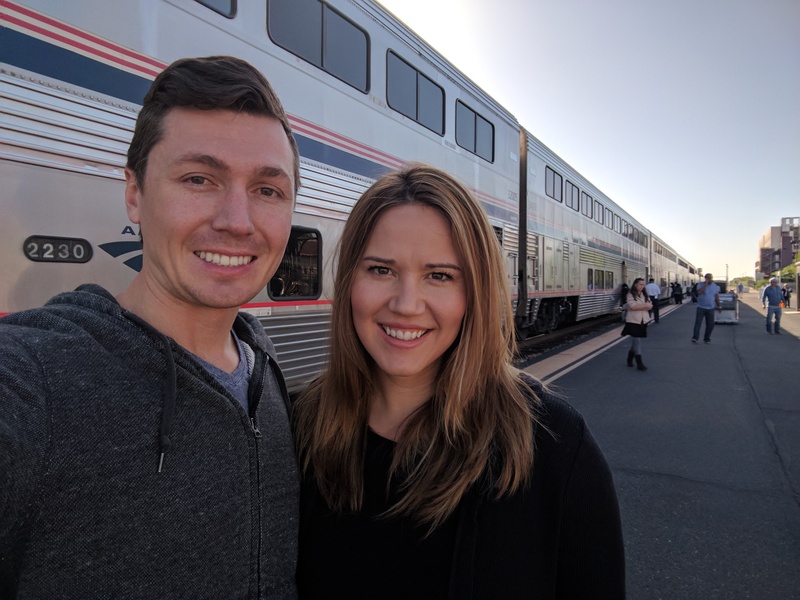 My wife and I will be travelling from Australia to ride the Texas Eagle from LA to Chicago, with a one night stopover in San Antonio in September. After three nights in Chicago we are riding the Empire Builder from Chicago to Portland. Hi Howard. That sounds like a really itinerary! 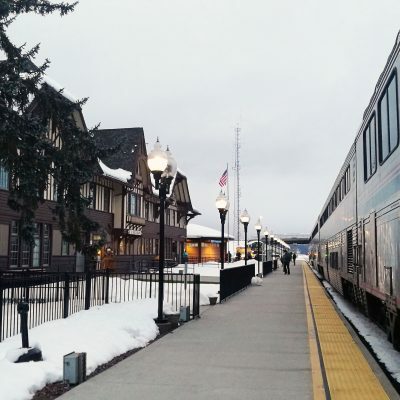 My girlfriend and I just took the Empire Builder this last winter from Seattle to Chicago and really enjoyed the trip. Excellent scenery and the train really travels away from civilization. Thinking of it, I’ll have to write up a report for that journey. LA, San Antonio, Chicago, and Portland are all fantastic cities, each very different than each other. Enjoy the trip! 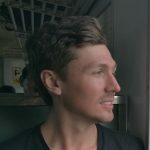 My wife and I returned to Australia at the end of September after riding the two trains I mentioned in my previous post. Our flight arrived in LA at 6AM and after a seamless transfer on the Flyaway bus we spent the morning wandering around downtown LA. 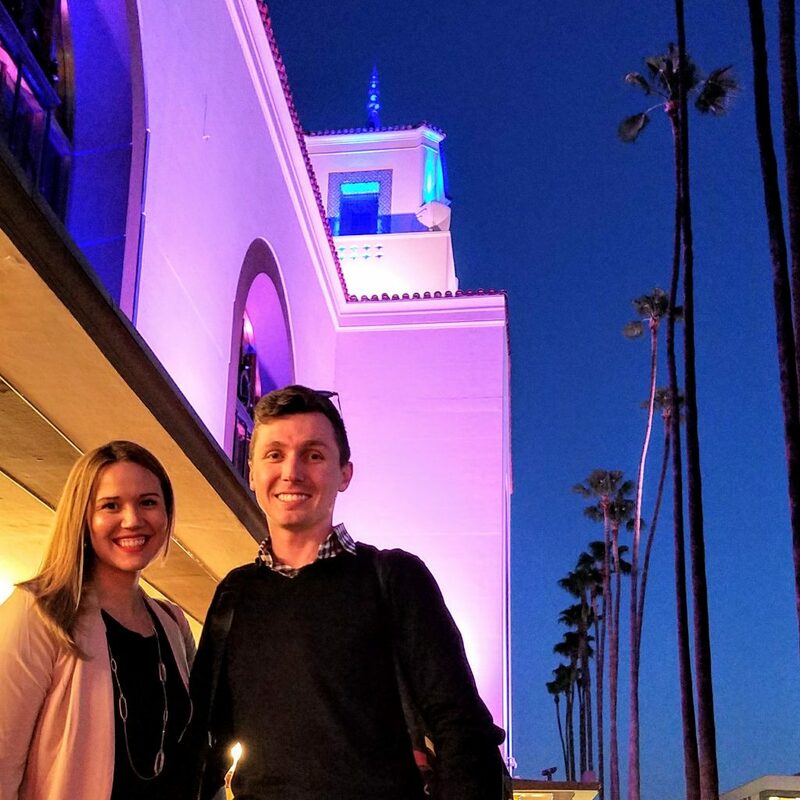 In the afternoon we went out to Santa Monica on the suburban train to fill in time before our 10PM departure on the Texas Eagle. While waiting to board the Texas Eagle it was good to be able to utilise the Amtrak Metropolitan Lounge for the free drinks and snacks on offer. On boarding the Texas Eagle we were delighted to find our sleeping car attendant was also Stephen, what a great guy. We asked Stephen to wake us at first light at Maricopa and we sat in the observation car all day. The following morning we alighted at San Antonio and spent the day walking around the San Antonio Riverwalk and the Alamo. The following morning we boarded the Texas Eagle for the run up to Chicago. Stopping in San Antonio required two very early morning starts but it was worth the effort. 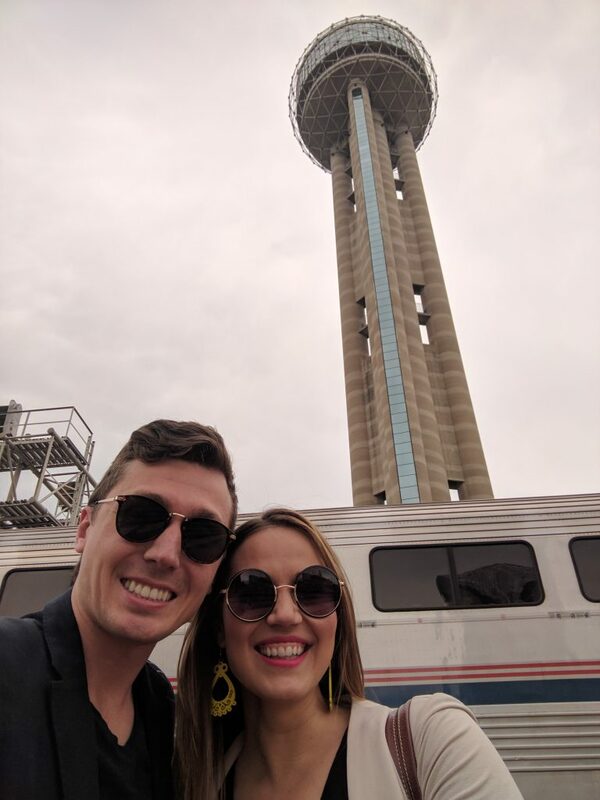 During a short stop in Dallas I was standing on the platform when Stephen our previous attendant who was about to board the southbound Texas Eagle approached me on the platform and engaged me in conversation which was a nice gesture. After three nights in Chicago we travelled on the Empire Builder to Portland and we enjoyed travelling across the northern plains, again we rose at first light and sat in the observation car all day. The run down the Columbia River to Portland the following morning was most enjoyable and we had great views of the snow covered Mount Hood which was bathed in sunlight. Our only complaints with Amtrak was that the temperature in the sleeping cars was too low however our attendants were kind enough to cover the vents which made it much more comfortable, and the cold breakfast on the Spokane to Portland leg was not great. Next year we hope to travel on the Southwest Chief eastbound and the California Zephyr westbound. Thank you, great review, greetings from El Paso.